The Greek capital can seem hot, dusty and daunting, but Melanie Ring discovers beauty and tranquillity in its winding back alleys, elegant gardens and ancient sites. 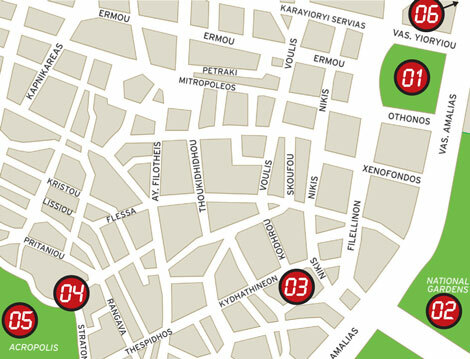 Start in the historic centre of the city at Platia Syntagma (Constitution Square) and join the chatting locals at one of the many cafés. Try a classic Greek coffee or a frappé (instant but strong, frothy coffee served cold), and sit back and soak up the atmosphere. At the top of the square is the prominent Greek Parliament building, where you can watch the pompom-shoed soldiers outside performing the changing of the guard on the hour, every hour. Built in 1842 for Otto, the first king of Greece, the building has had many uses – it was turned into a homeless shelter in 1923 during the Greek-Turkish population exchange, but was renovated following the return of a national parliamentary government in 1926. Look out for the Tomb of the Unknown Soldier – a monument to Greece’s war dead – at the front. Behind Platia Syntagma are the National Gardens, a must-see for any visitor to Athens, if only to slow down and escape the busy city streets. The entrance is next to the Parliament building on Leof Vas Amalias. Previously the gardens of the Royal Palace, they were created by Queen Amalia and her German gardener Schmidt in 1839. The grounds have shaded pathways lined with plants, flowers and trees, and there are pools teeming with ducks as well as a small zoo and a botanical museum on site. (Entry is free to the gardens; open daily 7am to sunset.) The neo-classical Presidential Palace, just around the corner off Irodou Attikou, was home to the Greek monarchy until 1974, and is also worth a look. Back across Vas Amalias, a short walk down Kydathineon will bring you to this colourful museum at number 17 (open 10am-2pm Tues-Sun, entry €2). It houses a diverse collection of costumes, embroideries, silverwork and pottery, along with a room full of wall paintings by primitive painter Theophilos. The collections go back as far as 1650, giving visitors a comprehensive view of traditional Greek culture. On your way out, you’ll notice the Byzantine church of the Transfiguration of the Saviour opposite. Built in the 11th century, it has been extended numerous times during the 19th and 20th centuries. Head back along Kydathineon, passing through café-filled Platia Filomousou, and turn right into Stratonos when you reach the edge of the Acropolis. Wander through the cobbled streets (Stratonos, Pritaniou and Alimberti) and around the whitewashed buildings which make up the pretty village of Anafiotika. These houses were built in the 19th century by migrants from the island of Anafi, who were brought to Athens after the Greek War of Independence to build the king’s palace. A trip to Athens is not complete without a visit to the ancient sites of the Parthenon, the Herodes Atticus theatre (a major venue during the summer music festival) and the Old Temple of Athena. But located in the immediate vicinity is the highly anticipated New Acropolis Museum (newacropolismuseum.gr), set to open early 2009 (although the ground floor is open to the public now). The geometrical structure, designed by the Swiss-American architect Bernard Tschumi, will house thousands of ancient Athenian artefacts, while the glass-floored lobby reveals the remains of a recently excavated site. After pondering awhile on the nearby Acropolis rock, take a leisurely walk down through the Roman market towards Monastiraki, which is a great place to pick up souvenirs. stylish, has an impressive menu with a distinct Asian theme, and is one of the best around. Once you’re in the groove, check out Briki (Dorileou 6; tel +30 210 645 2380), a popular bar with a laid-back atmosphere and seating which spills onto the streets.